ANNOUNCEMENT BAR GO HERE, TEXT GO HERE. At Gunbuyer.com, your safety and satisfaction is our number one priority. That is why we created our comprehensive Customer Care Plan on firearms purchased from Gunbuyer.com. This plan applies only to the original purchaser. On behalf of the purchaser, Gunbuyer will facilitate any repair or replacement with the manufacturer in accordance with their warranty policy. 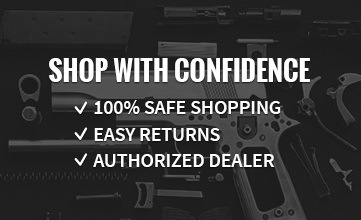 If the firearm cannot be repaired, and no replacement is available from the manufacturer, we will offer current retail value as a credit (amount to be determined by Gunbuyer) towards any purchase on Gunbuyer.com. If a firearm is repaired, it may be returned directly to the customer. However, if a firearm is replaced with a new or used firearm, the replacement must be sent to a valid FFL for transfer to you. The customer may incur additional charges from the FFL and will need to contact them prior to shipment of the replacement. Gunbuyer.com is not responsible for these additional fees. 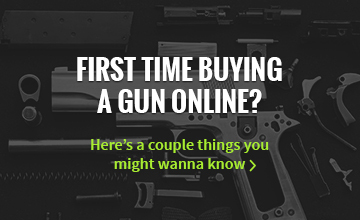 Gunbuyer.com will cover all shipping costs associated with a firearm warranty repair, replacement, or refund. This customer care plan covers the firearm as originally sold by the manufacturer and Gunbuyer.com, but does not apply to firearms that have been altered or modified after purchase. The customer care plan applies to the firearm only and does not include accessories added to the firearm. Accuracy is NOT included in this Warranty. This Customer Care Plan covers the firearm against manufacturer's defects. It does not cover normal wear throughout the lifespan of the firearm. Gunbuyer.com Liability for breach of any warranty shall be limited to replacing or repairing the nonperforming or defective goods as determined by Gunbuyer.com. We shall not be liable for any other damages, direct, incidental or consequential. The philosophy behind the Pistol Shooting Dynamics Line is very simple: focus on the achievement of the ideal synergy between shooter, firearm, and ammunition. Fiocchi keeps developing and improving its pistol and revolver cartridge products. It encompasses LRN, FMJ, JHP, FMJHP, and JSP bullet configurations in all the most popular calibers. Here at Gunbuyer we make the shipping process fast and simple for you! Whether you are purchasing a firearm and having it sent to your local Federal Firearms dealer or you’re picking up some ammo and having it sent to your home, we’ve got you covered! For more details please visit our Shipping page. Customer satisfaction is our top priority at Gunbuyer. If you are dissatisfied with your purchase or your package contents arrive damaged please review our Returns page for policy details and instructions. All Handguns will ship 2nd Day Air free. Long guns will ship Ground free. Ammunition, accessories, and any other item that is not a firearm will ship Ground Live Rate based on weight and destination. Expedited shipping methods may be added for additional cost. ©2017 GunBuyer. All rights reserved.